Firstly, is there any wonder why I couldn’t find a plus sized magazine anywhere in sight?? 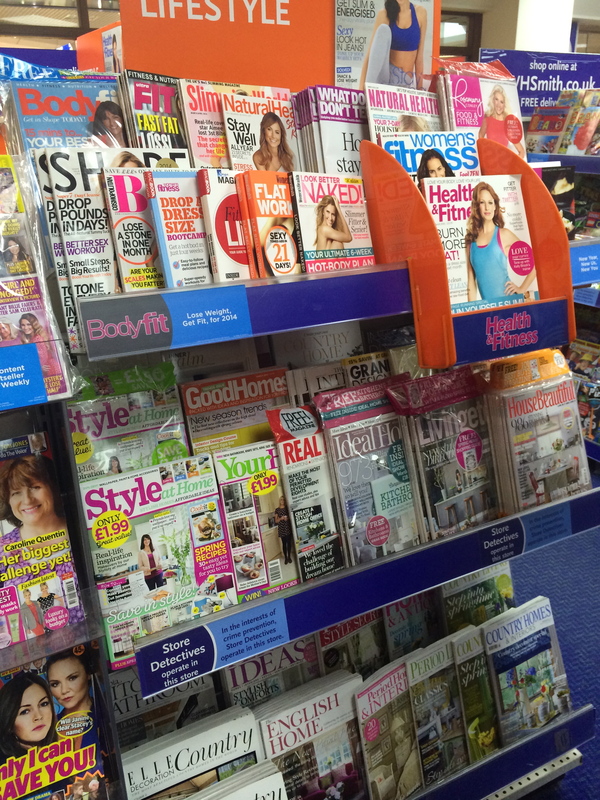 When all that appears to be on display is health magazines promoting getting thin and fighting fat! ‘Drop a Dress Size Bootcamps’, ‘Fight Fat & Win’ I mean come on. Really?? Yes I am a ‘big’ girl, yes I am a ‘plus sized’ woman and no amount of dieting has helped me. I think the only diet I haven’t tried is the 5:2 Diet. With media like this I am finding it increasingly difficult to find something to motivate other girls like me! I like fashion, I like confidence and gossip and go out to party with my friends. Just because I can sometimes out drink most of those I drink with does not mean I am looked at any differently by them so why by people who don’t know me? Why by the media? There are some stunning women out there that are a size 14 and I mean STUNNING. They have some of the most amazing pictures I’ve ever known, they could easily model clothes or just be an advocate for us plus size women. What has what I weigh got to do with anything I achieve in life? NOTHING is the honest answer. So, moving on to my second quest, to locate an outfit for this huge 30th birthday bash. I didn’t find one in a store anywhere! I looked in H&M, Dorothy Perkins, TopShop and even Evans, the latter scared even me with the options. I am determined not to go out to this bash dressed in a tent and I am even more determined not to go dressed in black! No way is THAT happening this time. Yes I have a lovely black dress stored in my wardrobe but I don’t want to wear black this time. I don’t want to stand out but I don’t want to be the usual one hiding at the back of photos just so you only get face shots of me… I’m making a stand against this. I’m going to make a change even if I have to do it one teeny tiny step at a a time. Anyway, I spent a very pleasant afternoon browsing the fashion world website, having ordered from them before I was content to do so again, plus having received a lovely message on twitter from them this morning, I thought I would give it a whirl. I’ve ordered another Claire Richards outfit, a dress, more specifically the lace trim dress. I ordered it because it was one of the few that was NOT sleeveless or modelled on a very small figure, amen to Claire Richards! There was also a very lovely looking dress on there in the AX Paris range, I’m seriously contemplating purchasing it! Maybe I will, watch this space.. Although I am looking for the dressier side of me I need to tap a bit more in to the casual side of this curvy girl. You saw me in jeans and a T-shirt, that’s good, but occasionally I’d like to wear something a bit different ya know? Mind you with the return of the random eye flare up I won’t be starring in any pictures for at least 2 days!! I’ve taken a bit of a liking to the Gemma Collins range, some of her clothes look quite appealing on the web but not convinced of purchasing any as it appears to be worn once and put on ebay, well at least that’s what the listings are saying! That cannot be a good thing, plus most were saying the size was ‘small’ now that is NEVER a good word to use on a plus size item of clothing. It’s hard enough finding clothing without discovering a specific plus size range is now being created on the ‘small’ side! Help! Anyone? I sometimes wonder what happens next and how to carry on trying to make a difference being just one person on my own, but I suppose it only took one person to stand up against racism so why can’t I stand up against this new found dislike of the larger person – ‘fatism’? I’m me and as much as I’d love to be slimmer, I have to work hard at that and I will but I also know I will never be a size 10 and I don’t want to be! I want to be more toned but as long as I am happy and healthy I’ll stick to that. I think we need more plus size models and we definitely need a plus size magazine. Ever noticed how store like New Look have a ‘curvy’ range but it’s only ever at a massive department store and the section is tiny almost like a bit of an after thought… I want to be able to go shopping for clothes with my friends and get their opinion without going into a buddy store like Evans, no offence meant but the clothes are super dated in there. I want real advice on what looks good on my shape of body knowing that possibly the average size of the reader is probably a size 20. It would be great to read reviews of good service or stores to purchase items, target the plus size stockists for advertising that kind of thing. Am I losing myself in a dream? It would be great to read articles by women like Claire Richards, Gemma Collins, Beth Ditton and Dawn French but to name a few! Perhaps even have a male part to it as well? I mean there are loads of opportunities but is there a demand for it? Would these celebrities even be interested in being a part of something like that? I’m fed up of people trying to peg me in a square hole but being a round shape, it’s not really going to happen! Anyway, I’m waffling! Today, I give thanks for the opportunity to write another blog and share my ideas with you my followers. I am grateful to http://www.fashionworld.co.uk for all their help today with the problems and perhaps finding me my perfect dress! « Just A Quick One… A Longer One To Follow Soon..